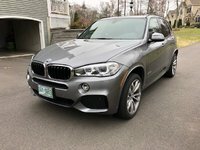 CarGurus has 1,972 nationwide X6 listings starting at $10,900. 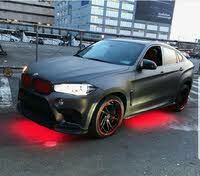 Few cars create as much controversy as BMW's X6. Not quite an SUV, but not a coupe either, the X6 combines elements of both into one package and generally leaves people either completely enthralled or utterly confused. Those who like the X6 cite its sporty looks and ride as reasons to love what BMW calls "the first Sports Activity Coupe." Seating 5 and packing 26.6 cubic feet of cargo space below the sloping rear roofline (59.7 cubic feet with the rear seats down), the X6 returns for 2017 largely unchanged. Up front will be your choice of a 3.0-liter 300-hp 6-cylinder engine or a 4.4-liter 445-hp 8-cylinder engine. With the 6-cylinder, you'll get your choice of rear-wheel drive (RWD) and all-wheel drive (AWD), while the 8-cylinder only comes in AWD form. Both engines are available only with an 8-speed automatic transmission. The smaller engine should be capable of delivering up to 18 mpg city/25 highway/21 combined, while the larger engine should return numbers of approximately 15/21/17. For 2017, the X6 will again be available with your choice of 3 trims—sDrive35i, xDrive35i, and xDrive50i. The sDrive35i and xDrive35i will be nearly identical—both will have the 3.0-liter engine, but the sDrive35i will be RWD, while the xDrive35i will be AWD. Moving up the chain, the xDrive50i will have the larger 4.4-liter engine and will be AWD. Choose the sDrive35i or xDrive35i and you'll get a seriously well-equipped SUV with plenty of available options to make sure you can customize your ride exactly how you'd like it. Jump in and the first thing you're likely to notice is the stately leather upholstery, accented by wood trim. This fits well with the car's standard navigation system, power moonroof, heated side mirrors, heated front seats, 14-way power-adjustable front seats, USB and Bluetooth connectivity, BMW iDrive infotainment system, 10.2-inch color display, push-button start, automatic climate control, power liftgate, rain-sensing windshield wipers, front and rear park-distance control, and ambience lighting. To really customize the X6, you'll be able to choose between several optional packages, including the Cognac/Bi-Color Interior Design Package (cognac/black Nappa leather), Ivory White/Bi-Color Interior Design Package (ivory white/black Nappa leather), Driver Assistance Package (head-up display and backup camera), Driver Assistance Plus (active driving assistant, surround-view camera, blind-spot detection, speed-limit info), Luxury Seating Package (ventilated front seats), Cold Weather Package (heated rear seats, heated steering wheel), Lighting Package (LED lights, automatic high beams), and Premium Package (SiriusXM satellite radio, 4-zone automatic climate control). 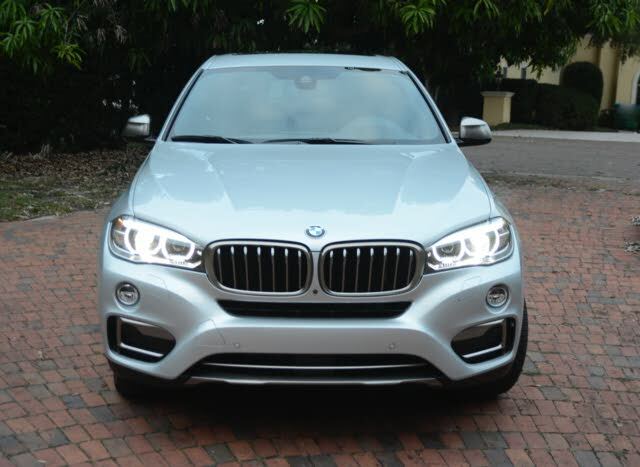 If you'd like to customize your X6 even further, you'll also be able to add several impressive standalone options, including an adaptive M suspension, wireless charging, a Harman Kardon sound system, rear-seat entertainment (two 9.2-inch color displays with DVD drive for rear-seat passengers), night vision, and a surround-view camera. While the luxury and performance tech is quite impressive on the X6, BMW hasn't forgotten safety, and will include serious safety gear on the X6 as well. Standard safety fare includes 4-wheel antilock brakes, dynamic stability control, electric power steering, a front and rear head protection system with front side-impact airbags, a rollover sensor, adaptive brake lights, and active front headrests. The X6 may not be for everyone, but those who like it tend to love it. Sure, its looks may be edgy and unconventional, but that's exactly what BMW is going for with the X6. If you're searching for a more traditional SUV, you may be better served by taking a look at the X6's sibling, the X5. However, if you want a real sense of sportiness you can combine with a dose of (measured) practicality, the X6 is a car you should consider adding to your shopping list. What's your take on the 2017 BMW X6? TheHorror It treats erectile dysfunction, without any medication! Have you driven a 2017 BMW X6?